You have got to try this easy sweet potato pizza crust! In a large mixing bowl , combine all the ingredients until everything is mixed well. Using the sides of your palms, work the mixture out into a round shape. It doesn't have to look perfect. Mine certainly wasn't. Bake for about 25-30 or until you feel the crust set. Cut slices with a pizza cutter and serve immediately. If you choose to add my dairy free cashew cheese , I highly recommend adding it first and putting the veggie toppings on after. Enjoy! This looks fabulous! Could i use another GF flour other than chickpea flour? I do not have that at home? Thanks! I bet you could use GF all purpose. Awesome! Great minds think alike! I made a sweet potato crust pizza this weekend but didn't add any nooch. I don't think I used enough flour either, will have to try this recipe, it looks great!! Thanks for sharing! Any ideas if you could substitute something else for the oat flour and chickpea flour? I would like to make this for someone I know who has allergies to soy, tree nuts, oats, eggs, dairy, and chickpeas. I may have to do some experimenting. I was going to suggest almond flour, but with the nut allergy, that will not work. You can try coconut flour, but it can be fickle, so I am not sure it will work. It also would have to be non-grain, as that person is also on a grain-free diet. I didn't have any luck with the cauliflower crust either. This one is so much easier! Why not with a mix of chestnut and chickpeas flours, it appeals me... Appetizing recipe I will experiment with my own flours mix! I think this recipe is adaptable to use the flours you like. This looks delicious! I just hopped over to the Blissful Basil site to check it out there too. Thanks! It's a great site. I agree! Melissa, I was wondering if you have tried the dough as a pasta? The combo/texture sounds like it may work? 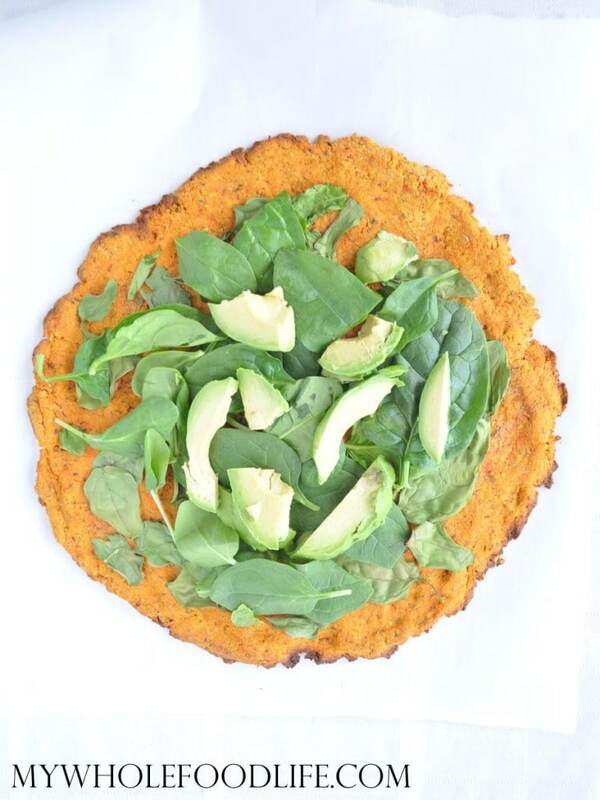 I made the sweet potato pizza crust last night using white rice flour instead of the oat flour and brown rice flour in place of the chickpea flour and it turned out delicious! I'm so glad I didn't wait to get specific ingredients to make it. I can't wait to buy more sweet potatoes and have this again!! I love this! It's one of my favourite recipes now. I like to add the toppings about 10 minutes before the base is cooked, so it's more like a regular pizza. The other day I used butternut instead of sweet potato. It was pretty good too, but sweeter. Oh yum!! I'll try that next time.